Coke FIFA 2010 Longest Goal Celebration – Brett Malden aka "bmw"
Clips submitted online or through mobile phone uploads were edited into a continuous loop to create a non-stop celebration that aired on the website throughout 2010. The Longest Celebration YouTube channel was localized in more than 100 countries providing an experience in local languages and was the largest scale partnership between YouTube and any other company to date. In the build-up to the 2010 FIFA World Cup, Coca-Cola ran a series of mini-competitions for people who uploaded their celebrations within categories that included “Most African Celebration”, “Happiest Celebration”, “Funniest Celebration” and many more. “The Longest Goal Celebration” was a key online element of the Coke’s sponsorship of the 2010 FIFA World Cup. 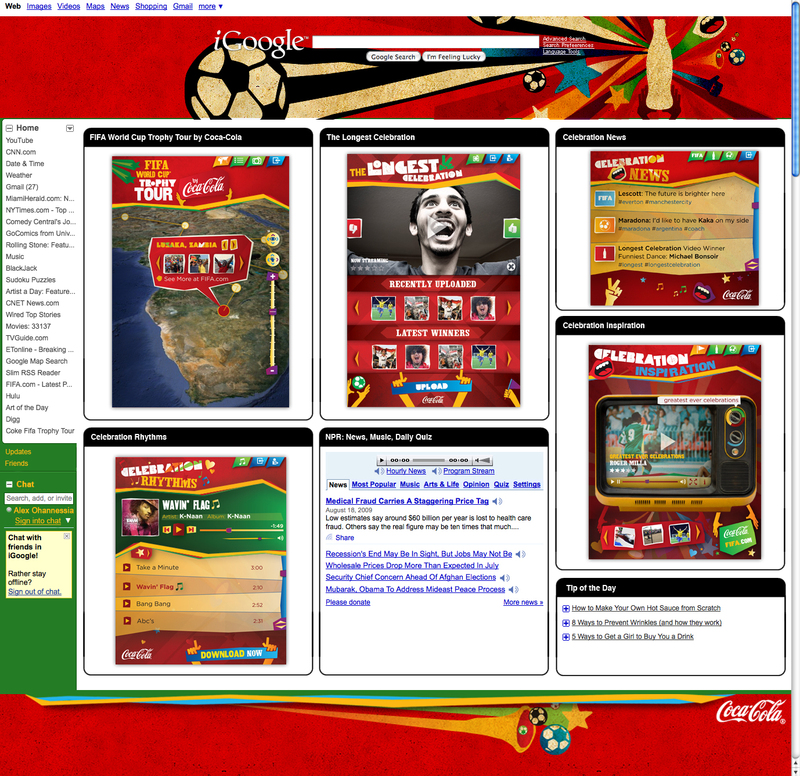 The online destination also included other digital components including widgets that allowed fans to follow the FIFA World Cup Trophy Tour by Coca-Cola, the ability to receive news feeds about FIFA World Cup information, listen to music tracks and watch videos of goal celebrations featured in a film documentary. Through sharing features on the videos and widgets fans also were able to post content on their favorite social networking site, web page or blog. Additional social media elements included content on the Coca-Cola Facebook Fan page and through the Coca-Cola Twitter feed. As an additional digital component for videogame fans, the EA SPORTS™ 2010 FIFA World Cup South Africa title featured Coca-Cola celebrations which could be unlocked through special codes from EA SPORTS and Coca-Cola channels in participating countries. After unlocking each celebration, fans could score a goal and use the controller to activate the celebrations. 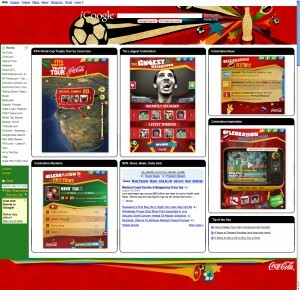 Finally, Coca-Cola related content, including photos and videos from the FIFA World Cup Trophy Tour, was prominently featured at the official website of FIFA, www.fifa.com, which during the course of the 2010 FIFA World Cup received an estimated 4 billion page views. Coca-Cola also brought the popular digital Panini sticker album to FIFA.com giving fans a way to trade and collect digital stickers of their favorite players. This entry was posted on Friday, June 10th, 2011 at 1:56 am. 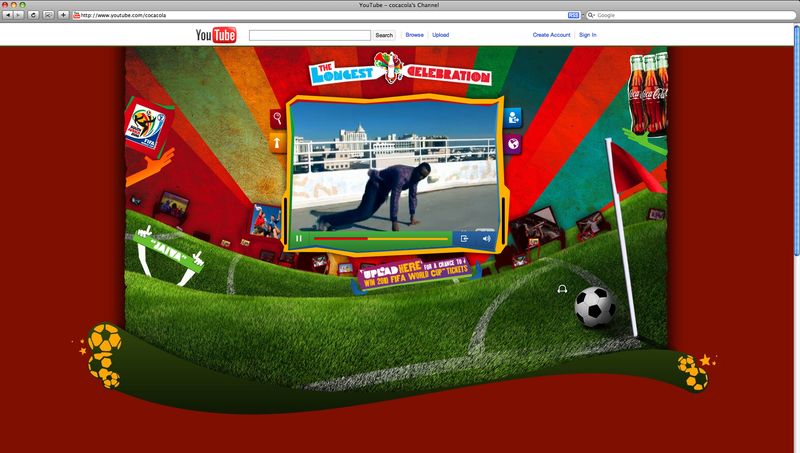 It is filed under Content, Portfolio and tagged with "The Longest Goal Celebration", 2010 FIFA World Cup, Brett Malden ECD, Brett Malden EP, Brett Malden Global Lead of Integrated Production, Coke, digital campaign, fan uploads, global campaign, global challenges, integrated content, Interactive, interactive gaming, mixed media, New Media, Online, online competitions, post to Facebook wall, Roger Milla, social media, South Africa, ugc, YouTube. You can follow any responses to this entry through the RSS 2.0 feed.